During January 2005, a survey prior to development was conducted in the area of Horbat Batra (Permit No. A-4335*; map ref. NIG 26345–80/7566–79; OIG 21345–80/2566–79), prior to enlarging the orchard area. The survey, carried out on behalf of the Antiquities Authority and funded by Qibbuz Merom Golan, was directed by O. Zingboym and A. Shapiro. 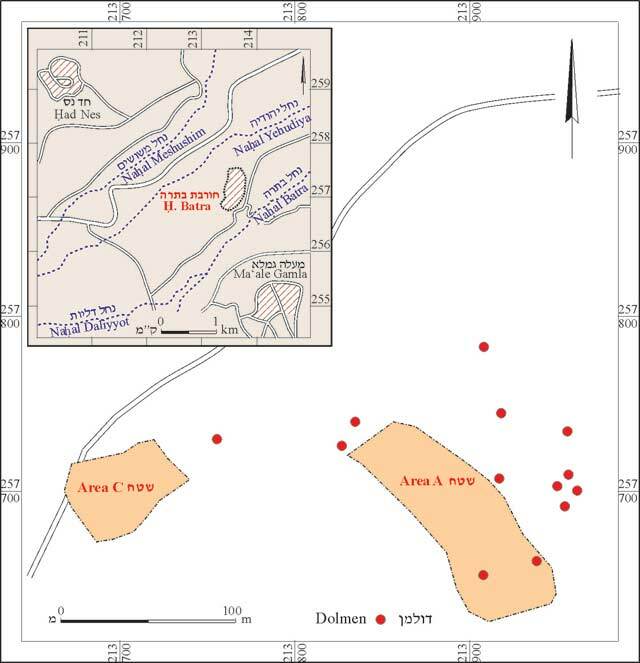 Two antiquities sites are located in the survey area: Horbat Batra and the Yehudiya dolmen field. Horbat Batra is located at the top of a basalt hill that is conducive to an agricultural settlement. The ruin descends precipitously to the east, toward the Nahal Daliyyot channel and gently to the west toward the terrace above the Nahal Yehudiya channel. The dolmen field is located north of the area that was surveyed, on an elongated spur between Nahal Yehudiya in the west and Horbat Batra in the east. The survey extended as far north as the southern part of the dolmen field. The region had previously been surveyed in the Emergency Survey of the late 1960s (M. Kochavi [ed. ], Judah, Samaria and the Golan, The Archaeological Survey of 1968, Jerusalem, 1972, p. 278) and in the 1980s and 1990s (‘Atiqot 34:27; ESI 18:5–6). 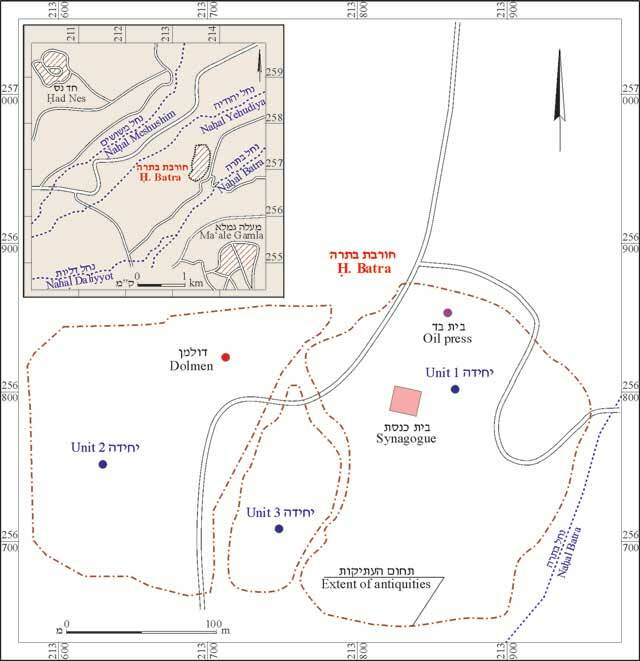 The site of the ruin is described in a study of synagogues in the Golan (Z.U. Ma‘oz, The New Encyclopedia of Archaeological Excavations in the Holy Land, 1992, 1, p. 293) and by D. Urman (BAR Int. S. 269, Oxford 1985, p.199). The area north of the orchard is delimited on the east by a military road and on the west and north by the lower slopes of the spur that is located between Nahal Yehudiya and Horbat Batra. Some twenty five dolmens were found in an area that ascends in the direction of the spur from the west and is east of the military road. The area is partly located within the precincts of the Horbat Batra site and is bordered in the north by the ruin, in the south by a bend in a military road, in the east by the steep slope in the direction of the Nahal Daliyyot channel and in the west by an orchard fence. Unit 1. Remains of walls, fragments of pottery vessels from the Byzantine period and elements of a public building, including column drums, capitals and a lintel, scattered along the western and southern slopes of the ruin, were discovered. It seems that a small part of the building, which was located alongside the military road in Horbat Batra, was damaged in the past by mechanical equipment. An olive press in the northern part of the site was surveyed in the past. Fragments of pottery vessels that dated to the Hellenistic and Roman periods were gathered in the eastern part of the area. Unit 2. With the exception on one dolmen, no remains of walls or potsherds were found west of the military road. Unit 3. A meager scatter of potsherds, which was probably the boundary of the site or outside of it, was located south of Unit 2. The area, adjacent to the northwestern part of the orchard, was delimited in the west by a terrace in the direction of the Nahal Yehudiya channel. Dolmens that had not been previously damaged by heavy equipment were found in parts of the area. The ceramic and architectural finds from Horbat Batra attest to an ancient settlement of the Hellenistic–Roman periods that was located in the eastern part of the site and probably also on the hilltop. The Byzantine-period settlement was in the middle and northern parts of the site, extending as far as the line of the olive press. In all likelihood, dolmens had existed in the orchard area, but were damaged during the course of agricultural work. 1. The survey map, Areas A and C.
2. The survey map, Area B.